AD 9, German frontier: Close to the Rhine, a Roman centurion, Lucius Tullus, prepares to take his soldiers on patrol. On the opposite side of the river, German tribes are resentful of the harsh taxes about to be imposed upon them. Suspicious that there might be unrest, Tullus knows that his men’s survival will be determined not just by their training and discipline, but by his leadership. What neither Tullus nor his commander, Governor Varus, realise is that ranged against them is the charismatic chieftain and trusted ally of Rome, Arminius, who has long been plotting to drive the Romans from the tribal lands east of the Rhine. A wonderful read! Couldn’t put it down – when may we expect the next treat? Attention to detail superb – I was there with Tullus and his force, spitting feathers re Arminius’ treachery and how easily Varus was taken in … things don’t change. @sae.bidwell: I’m glad you liked it! Book two, Hunting the Eagles, will be out next year. Great read, can´t wait for the next one. Fantastic reading . Can’t wait for book 2. @Bill: Many thanks! I’m glad you enjoyed it. Hunting the Eagles will be out in spring 2016. If you’ve got the time, a short Amazon (and/or Goodreads review) would be super helpful. It doesn’t have to be long. I’ll even mail you a signed limited edition Eagles at War postcard – if you’re interested! Many thanks – Ben. @Brian: Cheers! I’m pleased you enjoyed it. The sequel, Hunting the Eagles, will be out in spring 2016. If you’ve got the time, a short Amazon (and/or Goodreads review) would be super helpful. It doesn’t have to be long. I’ll even mail you a signed limited edition Eagles at War postcard – if you’re interested! Many thanks again – Ben. Ben I have read your book Eagles at War,and have just finished reading Roman Mask by Thomas M D Brooke and the story is virtually identical to yours.Strange? Hi Vic, and thanks for your comment. Virtually identical in that it’s about the Teutoburg Forest disaster, or something else? (Will email you.) Cheers. @neil916: Many thanks for your praise! I think that Eagles is better than the my first three books, and I am glad you think so too. Cheers! Ben. Hi Gary, and thanks a lot for your message. I’m delighted to hear you’re hooked! I hope you continue to enjoy my books for many years to come. Best wishes to you – Ben. Again a fantastic, wonderful read; and a great start for the new trilogy; can’t wait for the next one; looking forward to see what will happen with Tullus (and the rescued baby). @eduardo; perdoname por estar tan tarde – thank you, I am so pleased you liked Eagles at War! Saludos! Ben. First posting. Historical fiction is my favorite genre and I am a big fan. Loved the Forgotten Legion trilogy as well as all your other novels that I have gotten to. Can’t wait to read Eagles at War. Also looking forward to reading Rebellion and the 2nd and 3rd in the Hannibal series. Keep ’em coming! I just finished reading the Eagles at War books 1 and 2 (actually I read them 2 then 1). I keep being amazed at how history is stranger than fiction. I thought several times during reading that you must have made that bit up. But no, the end notes show that it really happened that way. I’ve read all your books now. 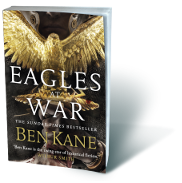 Can’t wait for the final volume in the Eagles at War series and more volumes in the Hannibal series. I guess I’ll have to be content with the short stories until then. Many thanks Ben. Brilliant books Ben, I’ve read your Hannibal and Forgotten legion series along with Eagles 1 and 2 so looking forward to number 3. keep up the great work! Please continue to distribute your books SA and I will most definitely read them all! Hi Gideon, and apologies for the delay in replying. Happy New Year to you! I’m delighted you enjoyed Eagles at War, and I hope you enjoy the other two books. Read the two free short stories that tie in with the first two books online at Wattpad, if you like…Best wishes – Ben.